Corban Estate Arts Centre Turns 10! In September 2002, the Corban Homestead Galleries opened with an exhibition commemorating 100 years since the founding of the Corban Estate Winery, with photographs by Marti Friedlander about West Auckland’s wine-making history. In the 10 years since, the arts centre has become what it is today, increasingly well utilised, recording participation by over 80,000 users per year, expanding arts programmes and future plans to improve buildings and develop the site. 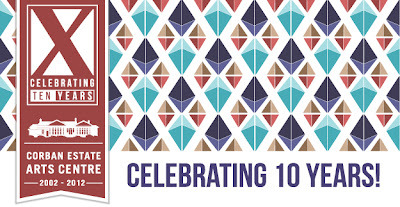 The 10 year anniversary takes Past/Present/Future as its theme and will be held over the period from 31 August – 9 September. It will honour the past in terms of the Corban Family and its winery, and there will be a number of events featuring the emerging talents of our youth community: Trash to Fashion, Phase 1 (youth devised theatre) and Word Up! (young peoples’ songs, poetry and raps). The weekend of 8 and 9 September is a time for reunion, connecting with old friends and meeting new ones, especially at the Pacific themed community feast. As well as viewing the exhibitions, visitors can add to a timeline display showing the 10 year history of the arts centre. There will also be tours and presentations over the weekend. Sunday 9 September, will feature the NZ Joystick Orchestra, an orchestral form originating in France and established in Auckland in April 2011. The orchestra presented a concert during the Rugby World Cup celebrations last year. Performers use joysticks to create electronic sound and visual pieces. There will be two workshop sessions where visitors can participate or watch, and a performance by trained orchestra members in the afternoon. Corban Estate’s 10 year anniversary pays respect to the Estate’s origins, celebrates where CEAC has arrived now and everyone who has made that possible, looks out towards its vision and hopes for the future.